We've all watched the ads on TV, seen it on the news, listened to it on the radio or read an article in the newspaper about a workplace incident involving a forklift that has caused serious injury or death to an individual. The victim in these workplace accidents is, in most cases, someone’s husband, father, son or brother. Would you risk leaving your wife without a husband, children without a father, parents without a child or siblings without a brother? If companies do not have an adequate traffic management plan and appropriate information, instruction and supervision available a forklift incident is expected to occur at any time. Suitable measures and clearly communicated safety procedures should be in place to reduce the risk of forklifts colliding with pedestrians. Safety procedures must be documented and clearly communicated to all operatives, especially site visitors, so that everyone knows their obligations. While safety signs are important, education is paramount. 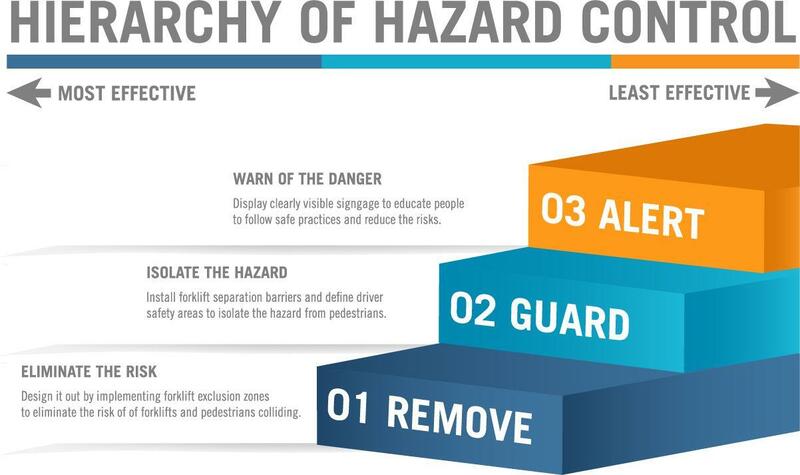 Within every states health and safety code there is a guideline that outlines the effective measures you need to take to control hazards in your workplace. By assessing, evaluating and implementing safer methods into your facility you can improve the way forklifts and pedestrians interact to eliminate the risk altogether. Forklift Exclusion Zones clearly define areas where forklifts are not permitted to enter which protects pedestrians and building structures such as workstations, work areas, offices and machinery. The clear objective of these zones is to ensure that pedestrians are safe to work and move freely in these areas without the risk of being struck by the forklift while it is in operation. 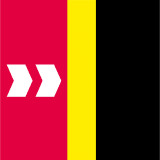 Line marking that clearly indicates exclusion zones and navigation throughout the plant facility is the most common solution used to eliminate the risk of forklifts and pedestrians coming into contact with each other. However, line marking alone is not enough. Physical barriers where possible around the plant, such as guard rails and fence systems, are a more reliable solution to prevent any interaction between pedestrians and operating forklifts or machinery. If you cannot remove the risk, pedestrian traffic should be completely isolated from the danger of being struck by any operating forklifts (including vehicles and trucks). When line marking doesn't provide the suitable level of protection, Forklift Separation Barriers are recommended for isolating such hazards. 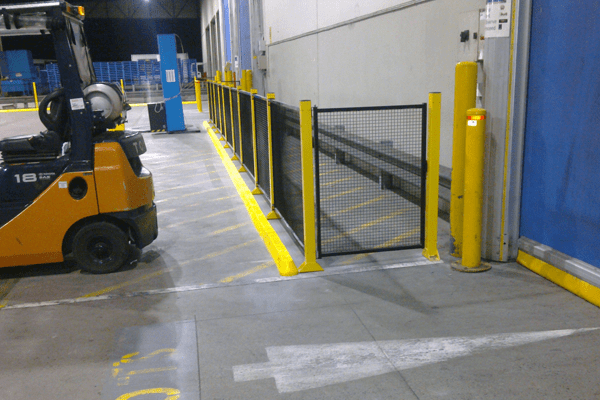 Forklift Separation Barriers clearly define walkways and protect pedestrians and bystanders from the forklift when it is in use such as around loading/receiving areas. The barriers suitable to these needs have to be constructed from a strong material, such as hot dipped galvanised steel, and mounted securely to the surface to provide the highest level of protection to the pedestrian should a forklift breach that area. Driver Safety Areas (DSA's) are an area set aside from the loading/unloading area when visiting drivers can wait safely while forklifts are in use. Clearly visible line marking ensures drivers have clear passage to the DSA when when exiting their vehicle. Alternatively, drivers may choose to stay seated in their vehicle while loading/unloading of goods takes place. Alongside line marking on the ground and physical barriers, signage must always be clearly visible in areas where forklifts (and plant machinery) are in operation around pedestrians. Industry standard safety signs range from (but are not limited to) speed limiting, pedestrian awareness and forklift in operation messages that are are all designed to alter the way people behave and perform around these potentially harmful environments. Signage not only instantly alerts and educates people about possible dangers ahead but continuous exposure over time has gratifying results to ensuring the success of such safety procedures in these environments. We have covered the importance of preserving the lives of your employees and the resources you can use to ensure a successful safety procedure around forklifts is implemented. What also needs to be addressed is ensuring that the future of your business is preserved. By preventing forklift incidents in your company you can not only save thousands of dollars in prosecution fines and legal fees, you also maintain worker safety and staff morale. Most people perform better when they feel valued. Create safer traffic management systems in your workplace before someone suffers the consequences. That someone could be you! Would you like a FREE Site Safety Audit? Our site safety consultant, Ted Harvey, is an experienced safety consultant with qualifications in Occupational Health and Safety (OHS) and Work Health and Safety (WHS) laws. Ted will ensure that your site is safety compliant and that you are meeting your Duty of Care responsibilities as an employer.